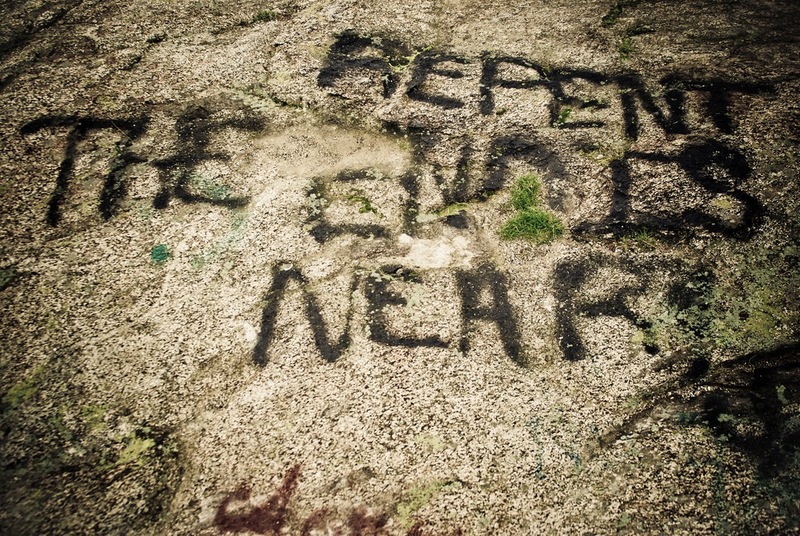 Have you ever seen one of those signs – “Repent! The end is near!” Makes you feel good, right? (Can you hear my sarcasm?) In truth, signs like this and people who espouse such views have already passed judgement on you before they even know you. They have decided for you that you are in error. It’s interesting to me how when many Christians speak of “the end” (or the “day of the Lord” or “the return of Christ”) they often jump quickly to judgementalism. Now, there are places in scripture that speak of a “day of judgement.” But I am talking about judgementalism, not judgement. The two are different. A judgement is essentially a decision. And we makes judgements everyday, from judging ourselves to be clean and well-groomed enough to go to work to making a judgement about whether we like a particular song or not. Judgements about ourselves and things for which we are responsible can be quite healthy. (Notice I didn’t say always healthy…in fact, some of our judgements about ourselves can be quite unhealthy!). But when we begin making judgements about others – passing judgement on people, places and things – then we become judgemental. Let me say this another way: making a judgement for yourself that something is good or bad for you is one thing; making a judgement for someone else is another thing. When we pass judgement on people places and things around us we enter into territory which Jesus strongly discourages (Matthew 7). Look briefly with me at one of our passages for this week, Thessalonians 5:1-11. Now concerning the times and the seasons, brothers and sisters, you do not need to have anything written to you. For you yourselves know very well that the day of the Lord will come like a thief in the night. When they say, “There is peace and security,” then sudden destruction will come upon them, as labor pains come upon a pregnant woman, and there will be no escape! But you, beloved, are not in darkness, for that day to surprise you like a thief; for you are all children of light and children of the day; we are not of the night or of darkness. So then let us not fall asleep as others do, but let us keep awake and be sober; for those who sleep sleep at night, and those who are drunk get drunk at night. But since we belong to the day, let us be sober, and put on the breastplate of faith and love, and for a helmet the hope of salvation. For God has destined us not for wrath but for obtaining salvation through our Lord Jesus Christ, who died for us, so that whether we are awake or asleep we may live with him. Therefore encourage one another and build up each other, as indeed you are doing. And our minds often put all this together in judgemental ways. That is, we apply these images and metaphors in negative ways towards others. Or, if we do apply them to ourselves, it is usually in relation to others (i.e., “I am not like them” or “I am better than them”), which is also judgemental because it involves passing judgement on others in comparison to yourself. Sunday, November 19, 9:15 am – Thanksgiving Breakfast – Invite a Friend!